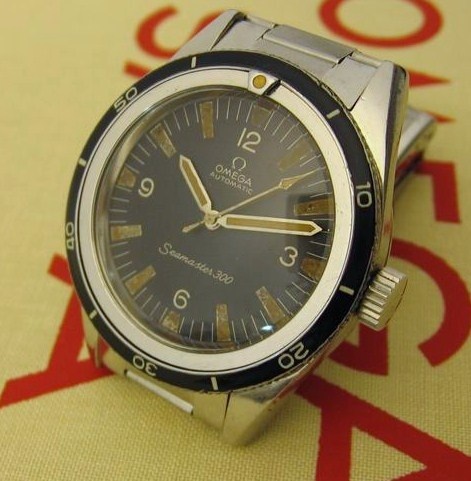 For quite some time a challenge for collectors of early Omega Seamaster 300 models (see Bill Sohne’s Seamaster 300: A History for a great quick overview of the SM300) has been the bezel inserts on some of the earliest models. The inserts were originally made of an early plastic material called bakelite which was brittle to begin with and gets increasingly brittle with age. Many makers in the period including Rolex and Omega used bakelite for bezel inserts until it was eventually replaced by more suitable and durable materials like acrylic or metals. 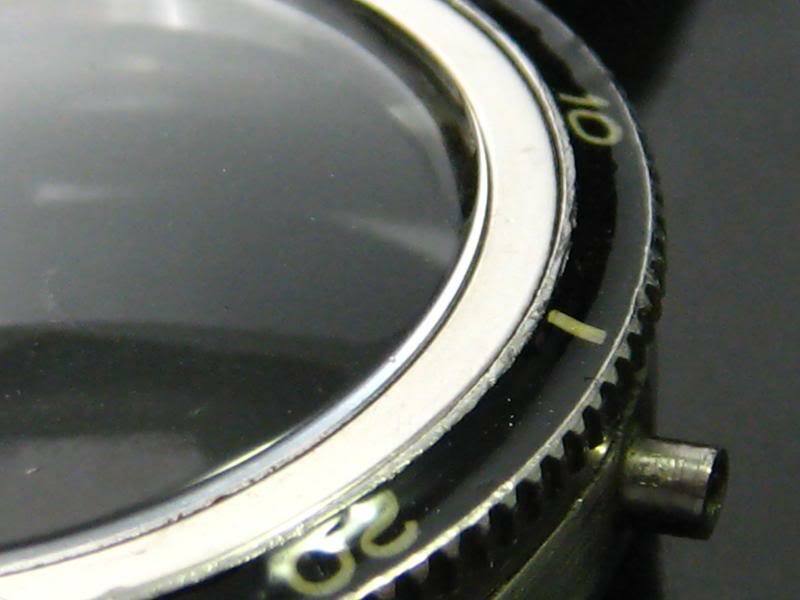 Collectors often find such watches with the bakelite bezel inserts in poor condition. They’re often cracked, broken, missing large pieces or just missing altogether, and examples with intact original bezels can often fetch enormous premiums. Omega Seamaster 300 with original bakelite bezel insert. Photo: "reficul_x"
Previously Seamaster 300 collectors often had little remedy for dealing with broken or missing inserts, as the Omega factory has not had any stock of these for quite a long while, owing not only to the model age but that their relative fragility had led to a strong demand for replacements over the years. A few years back there was a DIY “recipe” in the forums for creating home-grown replacements using things like successive layers of tinted epoxy and number decals borrowed from model railroad applications, a technique that often met with mixed results. Recently watchmaker and military watch enthusiast Aldo of Italy has started offering his own quality replacement bezel inserts for various early Omega Seamaster 300 models. They seem of very faithful reproductions of the originals and come in several variants, including the “countdown” bezel included on some of the earliest CK 2913 Seamasters. So if you’ve come across an early Seamaster 300 and need a bezel insert, Aldo’s replacements are an option well worth considering. I m one of Aldos very happy customers. He made a perfect replica bezel insert for my 14755. Can vouch fro his work, its sublime. Aldo, is not only a good friend, but is “the watchmaker” at all, a real “Master”. He work with a passion and a knowledge that rarely I have find. Many of my “tired” Speedmasters are now again on track. can you give me his address please? Thank you very much for the answer, i ll contact him! I just got my SM 300 14755-bezel back from Aldo. The insert is perfectly restored. Thank you! i am french: wath is your price (money) for make a bezel of seamaster 300 14755. 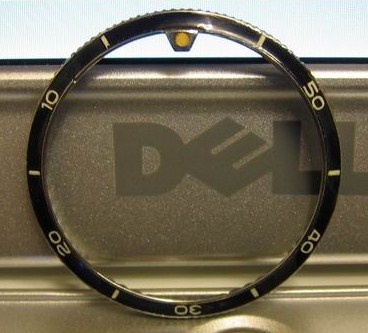 What is the price Omega Seamaster 300 CK 2913 replacment bezel insert ?. I have a scratch on my Omega Seamaster blue BEZEL. SS ring is O’K – just the blue insert. How can I buy it? – I don’t want to buy any fakes from many offers on internet. I have many fine tools, so I will replace this insert by myself. I prefer buying by personal check if possible. where can I get in touch with aldo to buy the bezel? would appreciate your help. thanks. A new bezel from Omega HQ is about 2500€.